Samantha Haywood, President of Transatlantic Agency is pleased to announce that Brenna English-Loeb has joined Transatlantic Agency as Assistant Agent. 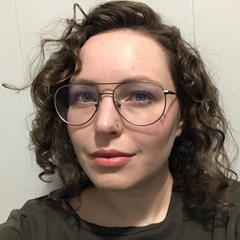 Brenna will be working closely with Samantha Haywood, Amy Tompkins and other senior agents with whom she will be coagenting new author clients of both adult fiction, nonfiction and YA. (See below for further details on her mandates.) Based in New York, Brenna began her publishing career as an intern with Writers House, before working for several years at Janklow & Nesbit Associates. Raised on an eclectic blend of Jane Austen, Terry Pratchett and Ursula K Le Guin, Brenna has always gravitated to unique stories with a strong point of view. She is specifically looking for works of YA and adult science fiction, fantasy, and suspense, as well as some adult literary fiction. She loves space operas, myth and fairy tale retellings, survival stories, epistolary novels, and heists. She also has a soft spot for stories that blend multiple genres and for works by and about underrepresented groups and identities. For nonfiction, Brenna is looking for serious, groundbreaking sociological work that holds our culture up to the magnifying glass. She also loves accounts of historical events and people that deserve to be better known, as well as unusual and influential object histories. Brenna can now be reached at: brenna@transatlanticagency.com.